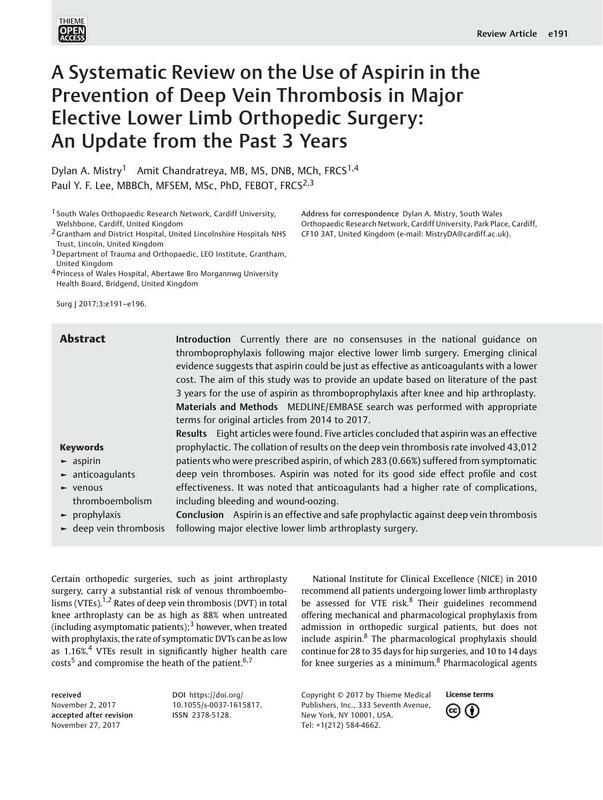 Introduction Currently there are no consensuses in the national guidance on thromboprophylaxis following major elective lower limb surgery. Emerging clinical evidence suggests that aspirin could be just as effective as anticoagulants with a lower cost. The aim of this study was to provide an update based on literature of the past 3 years for the use of aspirin as thromboprophylaxis after knee and hip arthroplasty. Materials and Methods MEDLINE/EMBASE search was performed with appropriate terms for original articles from 2014 to 2017. Results Eight articles were found. Five articles concluded that aspirin was an effective prophylactic. The collation of results on the deep vein thrombosis rate involved 43,012 patients who were prescribed aspirin, of which 283 (0.66%) suffered from symptomatic deep vein thromboses. Aspirin was noted for its good side effect profile and cost effectiveness. It was noted that anticoagulants had a higher rate of complications, including bleeding and wound-oozing. Conclusion Aspirin is an effective and safe prophylactic against deep vein thrombosis following major elective lower limb arthroplasty surgery.